Anaphylaxis is a severe, sudden, and potentially fatal allergic reaction to a foreign substance or antigen that affects multiple systems of the body. 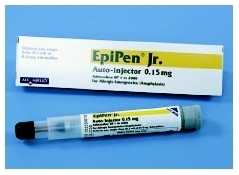 EpiPen Jr., a syringe containing a child's dosage of adrenaline, is used for the emergency treatment of anaphylactic shock. into the tissues, lowering the blood volume. Pulmonary edema can result from fluids leaking into the alveoli (air sacs) of the lung. Anaphylactoid (meaning "anaphylactic-like") reactions are similar to those of true anaphylaxis but do not require an IgE immune reaction. These are usually caused by direct stimulation of the mast cells. The same chemicals as with anaphylaxis are released, with the same effects, so the symptoms are treated the same way. However, an anaphylactoid reaction can occur on initial exposure to an allergen as well as on subsequent exposures, since no sensitization is required. There is also a rare kind of food allergy, called exercise-induced allergy, that is caused by eating a specific food and then exercising. It can produce itching , lightheadedness, hives , and anaphylaxis. The offending food does not cause a reaction without exercise , and, alternately, exercise does not cause a reaction without ingesting the food beforehand. Although likely an underestimate, about 10,000 cases of anaphylaxis occur per year in North America, with about 750 fatalities a year. The exact prevalence of anaphylaxis is unknown, because milder reactions may be attributed to asthma attacks or sudden cases of hives, and more serious or fatal episodes might be reported as heart attacks, as the initial symptoms of hives, asthma, and swollen throat can fade quickly. The symptoms of anaphylaxis may occur within seconds of exposure, or be delayed 15 to 30 minutes and sometimes even an hour or more later, if the allergen is aspirin or other similar drugs. The sooner the symptoms occur after exposure, the more severe the anaphylactic reaction is likely to be. The first symptoms of an anaphylactic reaction are associated with the skin: flushing (warmth and redness), itching (often in the groin or armpits), and hives. These symptoms are often accompanied by anxiety ; a rapid, irregular pulse; and a sense of impending doom. Then the throat and tongue swell, the voice becomes hoarse, and swallowing and breathing become labored. Symptoms of rhinitis or asthma may also occur, causing a runny nose, sneezing, wheezing, and abnormal high-pitched breathing sounds, further worsening the breathing problems. Gastrointestinal effects may also develop, including vomiting, diarrhea, and stomach cramps. The child may be confused and have slurred speech. In about 25 percent of the cases, the chemicals flooding the blood stream will cause a generalized opening of capillaries (tiny blood vessels), resulting in a drop in blood pressure, lightheadedness, and even a loss of consciousness, which are typical symptoms of anaphylactic shock. The child may exhibit blueness of the skin (cyanosis), lips, or nail beds. The symptoms may be mild and fade spontaneously or be quickly ended by administering emergency medication. The anaphylactic episode is over for that particular exposure. After initial improvement, the symptoms may reoccur after four to 12 hours (a late phase recurrent reaction) and require additional treatment and monitoring. Late phase reactions occur in about 10 percent of cases. The reaction may be persistent and severe, requiring extensive medical treatment and hospitalization . This condition occurs in about 20 percent of cases. The child should be given immediate emergency care, if possible, and then taken to the emergency room or the local emergency number (e.g., 911) should be called if symptoms of anaphylaxis develop. A child having an anaphylactic reaction will exhibit typical symptoms of anaphylaxis, such as hives and swelling of the eyes or face, blue skin from lack of oxygen, or pale skin from shock. The airway may be blocked, and the child may be wheezing as well as confused and weak. The pulse will be rapid and the blood pressure may be low. Anaphylaxis is an emergency condition that requires immediate professional medical attention. Once a child has had an anaphylactic reaction, an allergist should be consulted to identify the specific allergen that caused the reaction. The allergist will take a detailed medical history and use blood or skin tests to identify the allergen. The allergist will ask about activities that the child participated in before the event, food and medications the child may have ingested, and whether the child had contact with any rubber products. Because of the severity of these reactions, treatment must begin immediately. The most common emergency treatment involves injection of epinephrine (adrenaline) to stop the release of histamines and relax the muscles of the respiratory tract. The injection is given in the outer thigh and can be administered through light fabric such as trousers, skirts, or stockings. Heavier clothing may have to be removed prior to the injection. After the injection, emergency services or 911 should be called immediately. A child with known severe allergic reactions should be carrying an allergy kit with epinephrine; if not, treatment will have to be delayed until emergency personnel can provide the required medication. For reactions to insect stings or allergy shots, a tourniquet should be placed between the puncture site and the heart; the tourniquet should be released every 10 minutes. If the child is conscious, he or she should lie down and elevate the feet. If trained, the parents or others present should administer CPR if the child stops breathing or does not have a pulse. After 10 to 15 minutes, if symptoms are still significant, another dose of epinephrine can be injected. Even after the reaction subsides, the child should still be taken to the emergency room immediately and monitored for three to four hours, since symptoms can redevelop. Other treatments may be given by medical personnel, including oxygen, intravenous fluids, breathing medications, and possibly more epinephrine. The epinephrine may make the child feel shaky and have a rapid, pounding pulse, but these are normal side effects and are only dangerous to those with heart problems. Steroids and antihistamines may also be given but are usually not as helpful initially as epinephrine. However, they may be useful in preventing a recurrent delayed reaction. If the child is being treated with beta blocker medications commonly used to treat high blood pressure, angina, thyroid disorders, migraines, or glaucoma, it may be difficult to reverse an anaphylactic reaction. Anaphylaxis is a severe disorder that has a poor prognosis without prompt treatment. Symptoms are usually resolved with appropriate therapy; therefore, immediate emergency care is essential. For children with known reactions to antibiotics , foods, insect stings, specific foods, or any of the allergens that can induce an anaphylactic reaction, avoidance of the symptom-inducing agent is the best form of prevention. Parents should advise healthcare personnel of the childs allergies . Parents should ask the doctor whether prescribed medications could contain the drug(s) to which the child is allergic. The child should take all medications by mouth, if possible, since the risk of anaphylaxis is greater with injections. Any child should stay in a doctors office or near medical care for a period of time after receiving injections of an antibiotic or vaccine. The child should avoid areas where insects breed and live. The child should not wear bright clothing, perfume, hair spray, or lotions that might attract insects. If possible the child should wear long sleeves, long trousers, and shoes when out of doors. The child must be instructed to never again eat that kind of food that causes an anaphylactic reaction. Parents should carefully read all ingredient labels of foods that the child might eat and be aware of the different terms used for various foods, such as caseinate for milk or albumin for eggs. Parents should ask about ingredients in foods while eating out with the child, bring safe substitutes from home, and bring an allergy kit. Parents should be aware of possible cross-contamination, such as when an ice cream scoop is used for Rocky Road ice cream, which contains peanuts, and then for vanilla ice cream. School kitchen personnel should be notified of the childs condition. The child should avoid eating foods that might cross-react with foods that the child is allergic to, for example, if the child is allergic to shrimp, the child may also be allergic to crab or lobster. When traveling to other countries, parents should learn the appropriate words for foods that trigger their childs allergy; in addition, parents can request that air carriers serve peanut-free snacks to all passengers when their child is traveling; also the child should avoid eating airline meals. The child should avoid all latex rubber products. If the child has to be hospitalized, the parents should alert the hospital personnel to the childs allergy to latex. A child with a latex allergy may also have allergies to kiwi fruit, passion fruit, papayas, bananas, avocados, figs, peaches, nectarines, plums, tomatoes, celery, and chestnuts. In addition, children with a history of allergic reactions should carry an emergency kit containing injectable epinephrine and chewable antihistamine and be instructed in its use. A child who is not prepared to deal with an anaphylactic reaction is at an increased risk of dying. The allergy kit should include simple instructions on when and how to use the kit; sterilizing swabs to cleanse the skin before and after the injection; epinephrine in a preloaded syringe, as prescribed by the childs doctor in doses appropriate for children; and antihistamine tablets. The expiration date on the medications in the allergy kit should be checked and medications replaced as needed. Also, the epinephrine solution should be clear; if it is pinkish brown, it should be discarded and replaced. There are many brands of allergy kits. The simplest kit to use is the Ana-kit, which contains a sterile syringe preloaded with two doses of epinephrine with a stop between. Another commonly used kit is the Epi-Pen, which carries a single self-injecting, spring-loaded syringe of epinephrine. Two Epi-Pen kits should be carried, so that two doses are available. Allergy kits should be kept at home, school, and day care ; and the school administrator, teachers, and friends should be made aware of the childs allergies. Adults associated with the child should be trained in giving an injection and have a plan to transport the child to the hospital. Older children should be taught to give self-injections. Children at risk for anaphylaxis should also wear a Medic Alert bracelet or necklace or carry a medical emergency card with them at all times that clearly describes their allergy. A consultation with an allergist can help to identify the substances that trigger the reaction; the allergist can also provide information on how to best avoid the triggering substance. The allergist may also be able to give allergy shots to children with wasp, yellow jacket, hornet, honey bee, or fire ant allergies. These shots provide 90 percent protection against the first four insect reactions, but less protection against fire ant reactions. Premedication is also helpful in preventing anaphylaxis from x-ray dyes; also there may be alternative dyes available for use that are less likely to cause reactions. Desensitization to medications has also been successful in some cases. The process involves gradually increasing the amount of medication given under controlled conditions. The procedure has worked for sensitivities to penicillin, sulfa drugs, and insulin. The risk of anaphylaxis sometimes diminishes over time if there are no repeated exposures or reactions. However, the child at risk should also expect the worst and be prepared with preventive medication. Parents caring for children who are at risk for life-threatening anaphylactic reactions may experience high stress levels, for they have to maintain vigilance in order to protect the child while creating a sense of normalcy as the child grows up. Parents can reduce their stress by using social support groups, accepting their childs condition, and maintaining a positive attitude. Allergy —A hypersensitivity reaction in response to exposure to a specific substance. Epinephrine —A hormone produced by the adrenal medulla. It is important in the response to stress and partially regulates heart rate and metabolism. It is also called adrenaline. Immunoglobulin E (IgE) —A type of protein in blood plasma that acts as an antibody to activate allergic reactions. About 50% of patients with allergic disorders have increased IgE levels in their blood serum. Barber, Marianne S. The Parents Guide to Food Allergies: Clear and Complete Advice from the Experts on Raising Your Food-Allergic Child. New York: Owl Books, 2001. Coss, Linda Marienhoff. How to Manage Your Childs Life-Threatening Food Allergies: Practical Tips for Daily Life. Lake Forest, CA: Plumtree Press, 2004. Jevon, Philip. Anaphylaxis: A Practical Guide. London, UK: Butterworth-Heinemann, 2004. Smith, Nicole. Allie the Allergic Elephant: A Childrens Story of Peanut Allergies. San Francisco: Jungle Communications, 2002. American College of Allergy, Asthma, and Immunology. Available online at http://allergy.mcg.edu (accessed October 10, 2004).